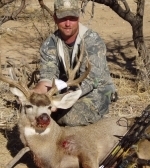 "I am a native to the Arizona desert and have been hunting for over 30 years. My dad taught me and I in turn taught my family. I have had a great deal of success when it comes to Coues Whitetail, and many success stories helping family and friends. Throughout time I wanted more of a rush and in some way to get closer to the animals I have become so familiar with. This is when I decided to turn to archery hunting. I am a self taught archery hunter and started in 1996. Since then I have managed to harvest Coues, some very nice Mule Deer, Elk, Javelina as well as Turkey. Not only am I passionate about the sport, I love the challenge."